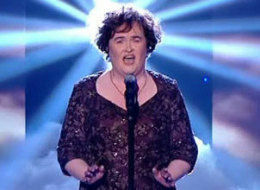 I was captivated by Susan Boyle when we all first saw her in the auditions for Britain's Got Talent and eagerly awaited her progression to the next tier of competition. I'm still a fan, but felt her song choice in the semi-finals, Memory from the musical Cats, was the wrong melody for her to sing because it requires a high soprano with a delicate voice. Susan is more a contralto and, for me, suffered when she hit the upper levels, especially at the beginning, which sounded squeaky and tinny and at times slightly off key. Some of it might be ascribed to nerves and our expectations, which in the first round were non-existent. Now, with the whole world watching, not to mention CNN, the American networks and Oprah, the pressure had to be enormous and with this particular, very difficult musical number the experience must have been daunting. That said, two thirds of the way through and after the musical bridge, the key seemed to change a bit and her voice had the power we remembered when she sang I Dreamed a Dream from Les Miserables. Through it all the audience didn't seem to mind and was intent on sucking up to an anointed star, as did the judges. Even American Idol's Simon Cowell joined his colleagues in a standing ovation, though, unlike Amanda Holden and Piers Morgan, he hadn't done so when Susan overwhelmed us after her first performance. I have to say I wasn't thrilled with her patter after the song, as it made her look a bit cocky. I don't expect a "Shucks, you really liked me?" sort of thing, but when they asked about the pressure, she said "What pressure?" and didn't at all appear to be joking. Though she's certainly getting used to the fame and publicity on Twitter, she won't continue to endear us if she seems to be conceited. In spite of this I'm not worried, because I think she's basically a sweetheart and more importantly her voice is still terrific. Plus, all great singers do better with some songs than with others. The only problem is that she is not going to be afforded the opportunity to sing a medley now that she has made it into the finals, having received the most votes from the audience phone-in after her semi-final stint. I don't know whether she'll get more than one song to sing next week, but to win the contest she should revert to a song that shows her greater strengths, one which is in her complete range so that she can demonstrate she deserves to be a musical star. If she's going to sing a standard, I might suggest You'll Never Walk Alone or If I Loved You from Carousel or Climb Every Mountain from The Sound of Music. These songs have the power to move us and enough compassion for the tender moment and will afford her every opportunity to soar and achieve her goal, which is not only to win the competition but also to sing for her Queen.